Among the rich holdings in the Historic Collections at the University of Aberdeen is an item that purports to be an original copy of Blake’s Visions of the Daughters of Albion. *↤ For assistance with archival research, I am grateful to Iain Beavan, Head, Special Libraries and Archives, Historic Collections, University of Aberdeen; and to Sheila O’ Connell, Assistant Keeper, Department of Prints and Drawings, British Museum. I am also indebted to Robert N. Essick for helpful comments on a draft of this article, and for additional information about Muir’s facsimiles. Dated 1793 on the title page, this slim folio, bound in maroon Morocco leather, contains all eleven illuminated plates that normally comprise Visions, and at first glance there is no indication that it is anything other than an authentic copy of Blake’s book. My excitement on an initial inspection of this volume increased when I noticed that the date of acquisition—according to a label on the inside cover, the book was donated to the Library in 1900 by the “Misses Gordon,” of a prominent Aberdeenshire family—coincided approximately with the date at which one of the eighteen known copies of Visions went missing. Could this be the lost copy Q that was sold at auction at Sotheby’s on 24 February 1897, and has since been untraced?1↤ 1. Copy designations here as given in Bentley, Blake Books 464-78. Was Aberdeen University Library in the lucky position of the Bayerische Staatsbibliothek, where Detlef Dörrbecker recently discovered an additional, nineteenth copy (R) of Visions, previously misattributed as a facsimile?2↤ 2. A description of copy R can be found in Bentley, Blake Books Supplement 143-46. Unfortunately, the situation here is the reverse. Comparison with copy A of Blake’s original, in the British Museum, quickly revealed that the Aberdeen copy is a facsimile, and I was soon able to identify it as the lithographic facsimile produced by William Muir in 1884-85, one of a series of facsimiles of the illuminated books issued by Muir from the “Blake Press” at Edmonton in London between 1884 and 1890.3↤ 3. For a bibliographic description of Muir’s facsimile series, “The Edition of the Works of William Blake,” see Keynes, Bibliography 295-98. Bentley, “‘Blake . . . Had No Quaritch’” gives further details about the facsimiles and their sale. For general information about Muir (1845-1938), a native Scot who is reported to have spent a period in Aberdeen in the 1870s before moving to Manchester and then London, see Davies. Fifty copies of the Visions facsimile were produced, of which I have seen the British Museum and British Library copies. Apart from the inferior quality of the lettering, the many small discrepancies between Muir’s designs and Blake’s originals, and the sometimes crude coloring, one particular mistake in the text puts it beyond doubt that the Aberdeen copy is Muir’s handiwork. 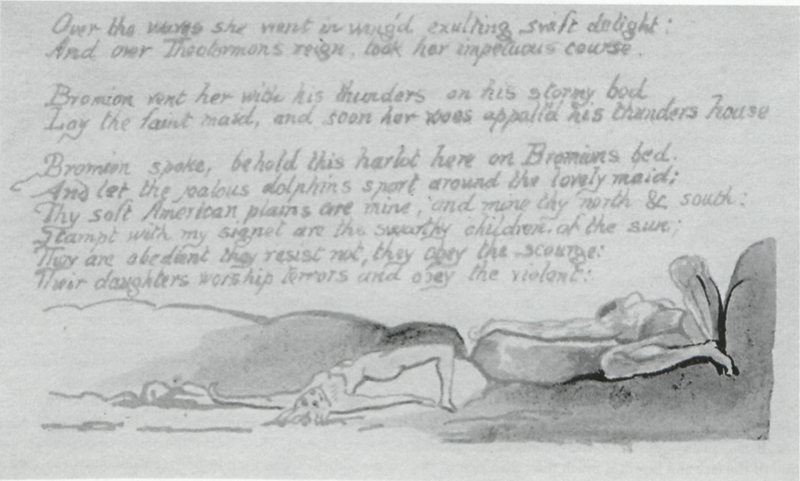 In copy A of Blake’s original, lines 16 and 17 of plate 4 read: “Bromion rent her with his thunders. on his stormy bed / Lay the faint maid, and soon her woes appalld his thunders hoarse.” Muir’s facsimile, which was based on copy A, garbles this climactic moment by omitting the period after “thunders” and transcribing “hoarse” as “house” (illus. 1). The same error appears in the British Museum and British Library copies of the facsimile, as it must in all others since the lettering is part of the printed design. Other copies of Muir’s Visions that I have seen are identical to the Aberdeen copy as far as the printed designs are concerned, but the ink overlay, additional graphic work and coloring differ considerably, such variation being a consequence of Muir’s production method—hand coloring. The Aberdeen copy and the British Library facsimile are both produced on paper bearing (on some plates only) the watermark “Hodgkinson and Co.,” a Somerset firm for which trading records begin in the 1850s (seven of the fifty copies of Muir’s facsimile were produced on “antique note-paper,”4↤ 4. Keynes, Bibliography 296. but these are not among them). The British Library copy is dated 1885; the similarity of paper type suggests that the Aberdeen copy is the same issue. What the Aberdeen copy lacks is Muir’s signature and the copy number, both of which would normally appear on the outside wrapper and identify it as a facsimile. The wrapper itself is also different, being made of brown card instead of the blue-grey paper normally used by Muir. The wording on it differs too: Muir normally prints the title in golden-brown or golden-yellow ink on the recto of the front cover, and includes Blake’s name. The title on the recto of the front cover of the Aberdeen wrapper is written by hand in black ink, and reads simply “Visions of | the Daughters of | Albion.” The cursive lettering exactly reproduces that of Blake’s own title page, and pencil lines are still visible that have been used to help align the letters correctly. A label identifies the binder as “Middleton of Adelphi,” a firm that traded from this Aberdeen address from 1889 till at least 1914. Library records indicate that the volume was almost certainly bound before it was acquired by Aberdeen University in 1900. 1. Detail from plate 4 of Muir’s facsimile of Visions, showing inferior quality of lettering and mistranscription of “thunders hoarse.” Reproduced by permission of the University of Aberdeen. was bound; I will come back to this. Another possibility is that at some stage the work has been deliberately passed off as a Blake original, by removing the external markers that would identify it as a facsimile. If so, this would not be the first time that one of Muir’s facsimiles has been mistaken for an original. Bentley (Blake Books 28-29) notes that Muir’s works were on occasion accidentally sold as originals, and Viscomi’s detailed investigation (ch. 21) of the Blake book trade of the late nineteenth century shows that there were also cases of fraudulence and forgery in which Muir’s facsimiles were implicated. 2. Extra plate in Aberdeen copy, showing Muir’s rendition of a detail from “The Ancient of Days.” Reproduced by permission of the University of Aberdeen. drawn by brush or pen. There is no printed design underneath. Besides being only a detail, the Aberdeen drawing does not closely resemble any of the other Muir versions of this image. The quality of execution, especially in the delineation of the face and beard, is much finer than that of the British Museum drawing. The coloring is also markedly different, both from this drawing and from the other Muirs I have seen (namely, the copies of Muir’s Europe in the British Museum and British Library, and the Keynes impression of “The Ancient of Days” now attributed to Muir7↤ 7. I have consulted the reproduction in Keynes, Engravings pl. 16. The Keynes copy of “The Ancient of Days” is one that Essick (258-60) identifies as a Muir facsimile rather than a Blake. ). Generally, the coloring of the Aberdeen drawing is much lighter. The beard is colored white and different shades of grey, with only a hint of yellow. The background is a simple grey wash, instead of the fiery red or pink of Muir’s Europe. There is no attempt to depict the shape or color of the setting sun. These differences, marked though they are, do not mean that the Aberdeen drawing could not have been executed by Muir. There is still a strong possibility that this is another Muir drawing: one perhaps intended (if its function was similar to that conjectured for the British Museum drawing) as a guide to how details of the face and beard should be added to the lithograph, or simply a preparatory sketch. Whatever its origin, this does not explain how it came to be bound with Visions, or why the Aberdeen volume as a whole fails to identify itself as a facsimile. About these matters, we can only speculate. Fraudulent intent, at the point at which the wrapper was added and/or the work was bound, seems highly unlikely, since, even in the absence of marks identifying it as a facsimile, the insertion of the extra plate would have dramatically reduced the book’s credibility as an authentic Blake. “The Ancient of Days” was, after all, one of Blake’s most familiar images, of which there is only one known sketch;8↤ 8. The sketch entitled “Who shall bind the infinite” in Blake’s Notebook 96. and the plate palpably does not belong here. It is therefore much more likely that the insertion of the extra plate and the substitution of Muir’s original wrapper (if there was one) were done innocently, either as or before the book was bound. There is, though, another possible explanation, from which a more important conclusion could be drawn. The only record we have of missing copy Q of Visions is the single auction at Sotheby’s on 24 February 1897, at which it is described as eleven plates “uncut and sewn” (Bentley, Blake Books 477). Since Muir’s facsimiles were also sold uncut and sewn, the possibility arises that the Sotheby’s copy was actually a misattributed Muir rather than an authentic Blake, and that the Aberdeen volume is this same copy with the insertion of “The Ancient of Days” drawing (obtained from another source) and the addition of the card wrapper. This is pure speculation, of course, but it is consistent with what little definite evidence we have, including the fact that the Aberdeen copy was bound sometime between 1889 and 1900. Even if the Aberdeen facsimile is not the Sotheby’s copy, the possibility remains that the supposed copy Q of Visions was in fact some other Muir stripped of its identifying features. We should, in other words, put a tentative question mark over the authenticity of missing copy Q.
Bentley. “‘Blake . . . Had No Quaritch’: The Sale of William Muir’s Blake Facsimiles.” Blake/An Illustrated Quarterly 27.1 (1993): 4-13. Bentley. Blake Books Supplement. Oxford: Clarendon Press, 1995. Blake, William. The Notebook of William Blake: A Photographic and Typographic Facsimile. Ed. David V. Erdman with the assistance of Donald K. Moore. Oxford: Clarendon Press, 1973. Davies, Keri. “William Muir and the Blake Press at Edmonton.” Blake/An Illustrated Quarterly 27.1 (1993): 14-25. Erdman, David V., ed. The Illuminated Blake. London: Oxford University Press, 1975. 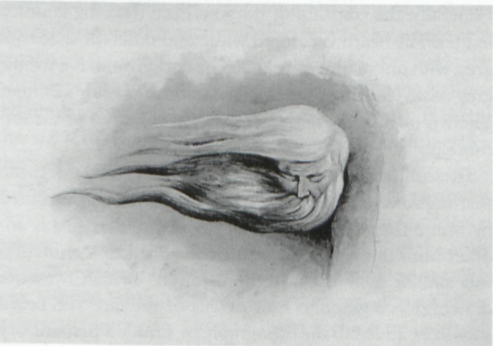 Essick, Robert N. The Separate Plates of William Blake: A Catalogue. Princeton: Princeton University Press, 1983. Keynes. Engravings by William Blake: The Separate Plates. A Catalogue Raisonnée. Dublin: Emery Walker, 1956.